The group has filled Myrtle Beach Pavilion more times than its members can count. The Catalinas have been the warm-up band for such acts as the Temptations, The Four Tops, & even The Monkeys in the summer of '97, before 35,000 people in Kingsport, TN. 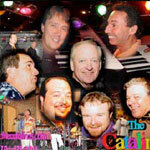 Since the Catalinas formed in Charlotte in late 1957, over 60 accomplished guitarists, keyboardists, trumpet players, drummers, bass players & singers have been a part of the band. Most have come from communities along the Interstate 77 corridor from Statesville to Charlotte. Gary Barker, a Statesville resident, who plays guitar & sings and owns the band now, started with the band in 1965, & is still with the band after all these years. "I just did not get into my head that I was getting paid to do something I love." Barker attributes the band's long success to the ongoing popularity of beach music & the tunes the band has composed, Particularly "Summertime's Calling Me" in the 70s. The band had its down moments including the death of lead vocalist, Tommy Black in a plane crash in 1968. Gary Barker has been the band's glue, keeping it going even when rock & roll in the late 60s & early 70s threatened to submerge the Catalinas & beach music. The Catalinas had little choice but to play their share of Crosby, Still, Nash & Grand Funk Railroad. "You either played it or you didn't get any work," said Gary Barker. Alan Eisele & Don West of Statesville have been fans of the Catalinas since the group's inception. They loved heading to Statesville's Grace Park Recreation Center on weekends in the '60s to hear the band perform. Eisele, Statesville's most recognized Elvis impersonator, credits the band's success to its appeal to '50 nostalgia; its "excellent musicians over the years"; its unbeatable lyrics; & the fact that the tunes are easy to dance to. "The music is good, so it endures," said West, who now owns West Properties in downtown Statesville. "I like to see them because they're fun."